Dinosaurs have long been a subject of fascination for both children and adults. Part of their mystique is that they went extinct 65 million years ago. But did they? This week Drs. Mark Norell, Sunny Hwang, and Diego Pol introduce evidence that shows one group of dinosaurs did not go extinct. They are related to such well-known dinosaurs as Tyrannosaurus and Velociraptor, and today we call them birds. First, we look at the classification of this one specific group of dinosaurs, the theropods. Then we look at the general body plan of the extinct members of the theropod group and how their features illuminate their possible behaviors. And finally, with these clues, we begin to illustrate the link between birds and dinosaurs. • Review the course orientation. • Find out about the characteristics that define the group known as theropod dinosaurs. • Understand why not all dinosaurs are extinct. • Examine the study of cladistics, which uses taxonomic classifications to reflect the evolutionary history of a group. • Identify the difference between non-avian and avian theropod dinosaurs. • Evaluate the anatomy and physical characteristics for non-avian theropods. • Begin to analyze the evolutionary relationships between theropod dinosaurs and modern birds. * Read Chapter 9 (pages 107-110 only), Chapter 11 (pages 141- 149 only), and Chapter 13. Most of what we know about extinct dinosaurs comes from the evidence we find in the fossil record. So learning where to look and spending time in the field looking for fossils is a large part of any paleontologist’s work. What is a fossil? Where do you find dinosaur fossils? Once you’ve found one, how do you retrieve and collect it? What can you learn from fossils? This week we answer these questions and more as we look at the tools and techniques paleontologists use when they are in the field and in the lab. We also go behind-the-scenes in the Museum’s vertebrate paleontology preparation laboratory to see how a specimen is prepared. * Read Chapter 11 (pages 149-168 only) and Chapter 12. Expectations Amazingly, paleontologists know a bit about how non-avian dinosaurs cared for their young, hunted for prey, and even made sounds. How do they know? The fossil record contains some clues—like the amazing specimen of an oviraptorid huddled over a nest of its eggs, similar to how a chicken sits on its nest and the way crocodiles build nests for their young. To study the behavior of long-extinct dinosaurs, paleontologists not only study the fossil record, but also get valuable insight from the behaviors of the living descendents of non-avian dinosaurs, birds, and the closest living relatives of dinosaurs—crocodiles. And finally we examine a controversial topic— were non-avian dinosaurs warm-blooded or cold-blooded? * Recognize that there are shared behaviors between modern birds and crocodiles. * Gain insight into the ways paleontologists make inferences about the behavior of long-extinct animals. * Determine how evidence for the behavior of long-extinct animals can be found in the fossil record. * Learn how the fossil record of theropod dinosaurs provides clues that help explain the diversity and behavior of modern birds. * Examine how modern bird and crocodile behavior is similar to the behavior of non-avian dinosaurs. * Study how scientists use fossil evidence to reconstruct the relationships between extinct species and modern species. * Look at new evidence that some non-avian theropods were warm-blooded. * Analyze a chicken or turkey skeleton to find several anatomical features common to both non-avian theropod dinosaurs and modern birds. What do you think are some of the problems with applying modern models to ancient organisms and their environment? What do you think are some of the factors that allow you to apply a modern model and still get reliable information? To what extent do you think scientists are reliably able to build a case based on fossil evidence, modern models, and inference? Read Chapter 10 and pages 160-161 and 224-227. * Were dinosaurs endotherms or ectotherms? We typically think of feathers, a beak, a wishbone, and a breastbone as the essential characteristics that define a bird. But in the last few decades, scientists have shown that these features aren't unique to birds. How then do we describe birds as a unique group? What is their evolutionary history? We first examine each of the features that have traditionally been identified with birds, and then trace the evolution of birds through their 150-million-year history. During this tour of bird evolution, we highlight the most current knowledge about the features or characters that define birds as a group, and then discuss the link between some of these characters and the non-avian theropod dinosaurs. Examine the characteristics traditionally used to describe birds. Explore several milestones in the evolution from non-avian theropod to modern bird. Determine the evolution of the features that enable birds to fly. Grapple with possible reasons for the evolution of feathers, flight, and other bird characters. 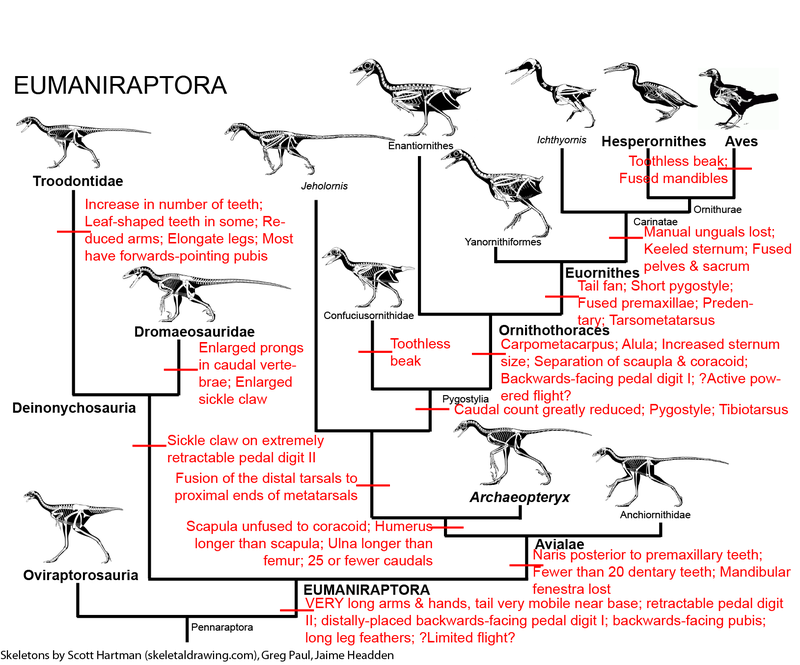 Look at how modern birds fit into the maniraptor family tree. Learn about the excavation and analysis of the dromaeosaur fossil known as "Dave." Compare several anatomical features of a non-avian dinosaur and an avian dinosaur. Hypothesize about the relatedness of an unknown specimen to an advanced non-avian theropod and a modern bird, using key characters. We typically think of feathers, a beak, a wishbone, and a breastbone as the essential characteristics that define a bird. But in the last few decades, scientists have shown that these features aren’t unique to birds. How then do we describe birds as a unique group? What is their evolutionary history? Read Chapter 9 (pages 114-124 only), Chapter 10, and Chapter 14 (pages 207-223). Be sure to look at the cladogram on page 208. * What is a cladogram? * Cladogram: questions and segments. * where does Dave belong? or here? or here? Let's now return to the mystery that surrounds the extinction 65 million years ago of what we now know was most, but not all, of the dinosaurs. The cause of the event is still shrouded in mystery. This week we look at some of the proposed theories to explain this massive extinction. 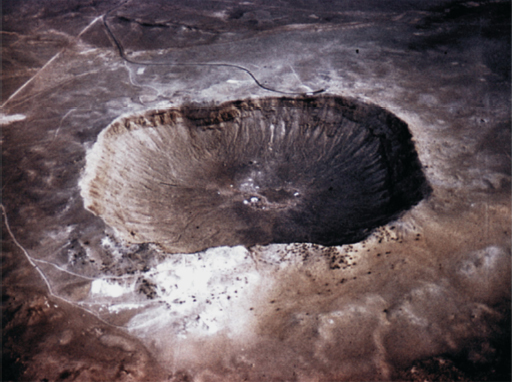 In particular, we examine the evidence for the two leading theories: a meteorite impact and extensive volcanism. We look at the evidence that supports and refutes these explanations, and begin to hypothesize about how the group of theropod dinosaurs we call birds and other small animals survived this mass extinction. Also: Please submit a rough draft of your final project. For the past four weeks we've explored the 235 million year history of avian and non-avian dinosaur evolution using the cladistic method. We investigated the evidence ourselves with our dinners in Week 3 and in Week 4 we tackled where to place the unknown specimens on the cladogram in the Theropod Interactive assignment. (There is still time to complete this assignment!!) Based on our study of the available fossil record it looks like there is a clear evolutionary relationship from Theropoda to Aves, but we learned that coming up with a true definition of a bird is not all that easy since visible attributes like feathers and flight don't provide us with adequate characters to classify them as a separate group. So now where do we go? Into one of the biggest unsolved questions of paleontology of course: what happened to all of the non-avian dinosaurs 65 million years ago? Take a moment and think about answers to the following questions. How do we study the dinosaur extinction? What do you hypothesize as the factors involved in such an extinction? The answer isn't as simple as it seems, as we'll discover this week.The Discussion Question this week asks you to wrestle with the evidence presented in the Course Essays and text and settle on an explanation for the K/T extinction. Be sure to support your decision in the Discussion with evidence from these and any other resources at your disposal. As always, please let us know if you have any questions or concerns. Read Chapters 3, 4, 5, and 6. Chapter 2 is also a recommended reading. Explore the pattern of the disappearance of non-avian dinosaurs 65 million years ago. * What killed the dinosaurs? Review different theories for the Cretacious/Tertiary (K/T) extinction. Examine and evaluate the evidence for the two leading extinction theories: meteorite impact and volcanism. * Goddard, P. "What else died out?" This week we come full circle and review the evidence that links modern birds to non-avian theropod dinosaurs. We look at the tremendous diversity of dinosaurs and birds found in the fossil record. Where did the dinosaur lineage split, and when do we find the first characters for Aves? We know that a split occurred, but these days the divergence still raises more questions than answers. Maybe birds aren't as special as we thought. TEXT READINGS: The Mistaken Extinction by Lowell Dingus and Timothy Rowe Read Chapters 7, 15, and 16.